Reishiki is important for self-discipline and safety during the practice, since it reminds the students that they are there to study seriously. The details of laying out equipment and the precise form Reishiki takes will vary from Dojo to Dojo but that given here is fairly typical. The student when visiting merely follows the particular form of that school. A training session without Reishiki will be casual and lacking in form, which prevents the development of united spirit among students and also leads to accidents. The effect of Reishiki is that from the moment of entering the Dojo all outside thoughts are to be put aside until we leave again and to create a proper atmosphere for serious study. The atmosphere should not be over strict or depressing. Amusing incidents often occur and the students should feel free to laugh or talk providing that this is not interfering with training. In actual fact the student is normally fully occupied during training and so discipline is hardly a problem. Enforced discipline is of little worth. The student must himself want to follow his own discipline and etiquette to build his character. The correct style of entry to the Dojo is shown in plate 109, the breastplate and lower armour have been donned in the dressing room and the head towel, gloves and loose cords placed inside the mask, which is carried grill downwards under the left arm. The Shinai is carried in the left hand, parallel to the floor. A Tachi-rei (standing bow) is made on entering the Dojo and the more senior students line up in order of grade to the instructor's left-hand side. Plate 110 shows the Seiza (seated posture). The spine and head are erect and the body sits well back on the heels. The body-weight is dropped to the stomach and the hands placed on the knees. The Shinai is placed to the left side with the guard level with the knee and the mask laid on the gloves, to the front, with the towel draped across the top. The Senior student ensures all are ready then shouts 'Kyo-tsuke' (attention) and everybody braces up and pays attention. The second command will be 'Rei' and the class and teacher perform Za-rei' (kneeling bow) as in plate 111. The left hand is placed on the floor followed by the right, the elbows lowered to touch the floor and the forehead to touch the hands. A high ranking teacher will often be accorded the courtesy of a special salutation and on the command 'Sensei-ni-rei' (bow to the teacher) the class bows whilst the teacher remains in Seiza position. Japanese Dojo have a Kamiza or shrine and a bow is made in this direction. It is also etiquette to pass in front of the teacher and perform Zae-rei by way of thanks after an evening's instruction and also to other students. Before any practice, exercise with a partner, or contest, the following form is always followed. The junior approaches to the senior and both make Tachi-rei as in plate 112, in this case the Shinai is at an angle as though in a scabbard. 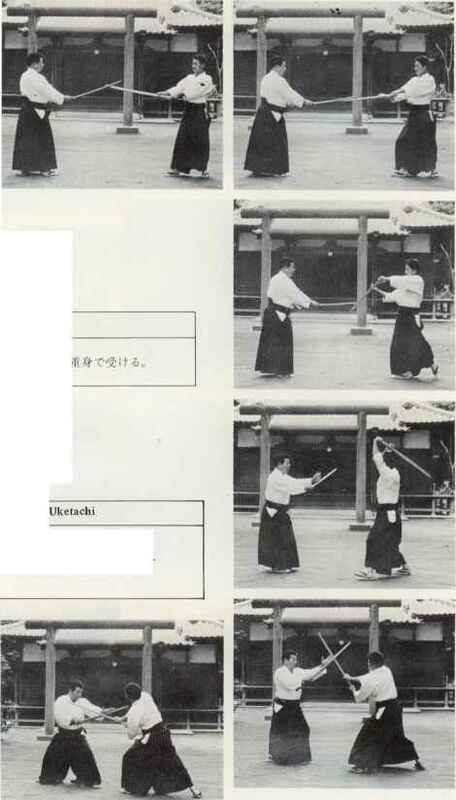 Next the two participants move to Ma-ai (fighting distance) and drop down into the Sonkyo (crouch position) and make the motion of drawing a blade with the right hand, over the head and down into the Chudan (middle step) position. The left hand is placed in position as in plate 113, and upon standing and assuming correct Seigan (natural posture) as in plate 114, they are ready to begin. The same form applies in reverse on finishing. All bows are performed as naturally as possible, with rather a military flavour, avoiding both casual half bows and heavy elaborate ceremony. The bow is a courtesy or greeting to the opponent and should be treated as such. Its meaning is that all students help one another to progress and wish to understand one another by direct technique and spirit during practice or competition.